There are three surviving species of cassowary. As many as 42 sub species have been described. The largest is the Southern Cassowary C. casuarius found in N E Queensland and Indonesia. 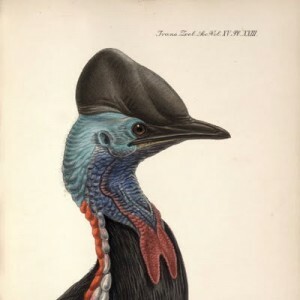 The Dwarf cassowary C. bennetti and the Northern cassowary C. unappendiculatus are found in Indonesia. Walter Rothschild described 8 species and 17 sub species in 1901. The plates that accompanied his notes painted by John Keulemans were published in the ‘Transactions of the Zoological Society of London’ of that year. The prints were copied from live specimens so one would assume that those are accurate in details of size and colour. From his descriptions of those imported into Europe many birds would appear to be C c. beccarii and C c. Violicollis both found on the Aru Islands. These are big, aggressive and have two red markings running from the base of the mandible to the top of the wattles. More recently birds from Aru have been grouped together and re-classified as sub species Casuarius casuarius aruensis. However, within Europe there is quite a lot of size variation and I suspect there is a mixing pot of Indonesian birds here. Australian birds have a plain blue throat; they are often smaller and seem to be more biddable than some of the Indonesian birds. All three of the species are under pressure from many threats primarily deforestation, busy roads, domestic dogs, and feral pigs. They are also hunted by man for food in some areas. On top of all that climate change is now playing its part as the rain forest begins to get dryer. IN CAPTIVITY there are good numbers of cassowaries still being held they can live up to 40 years, though it is unlikely that females will lay eggs after 20 years of age and probably stop some time before then. If the large ratites have any claim to intelligence, then the flag would be carried by the Cassowary. Very fast powerful birds with an air of indifference, Cassowaries can and have killed people. Females are especially ill tempered and even male Cassowaries keep out of the female’s sight until their services are required for breeding and chick rearing. The Cassowary can run at speeds approaching 50km/h and jump 1.5 m from a standstill. The legs are robust the three toes on each foot are equipped with long stout claws. When annoyed these birds will display the full throat colour, making loud guttural rasping noises, and attack by jumping up kicking forward with both feet. It has been said that the mythical dragon stories arose from early sightings of wild Cassowary. To know when a Cassowary is in a mood is not easy, as prior to attacks they are often standing quietly preening. Erring on the side of caution they should be managed by way of gates and sliding doors. Keuleman's illustration of Casuarius c. beccarii publ. 1901. Many imported into Europe have been this subspecies. Cassowaries are forest creatures that need plenty of cover, and like many rainforest animals their feet cannot cope with a hard dry surface for this reason they should have access to mud and a water pool. They will spend much of their time standing in water if given the opportunity, in the past collections have exhibited these birds quite poorly and not in- keeping with their natural history. At least two paddocks are needed to safely manage and breed cassowary Here at Paignton we have five paddocks all easily connected this allows us to move birds with out the need to capture them. Connecting gates are fitted with thumb latches and can be swung quickly shut from the outside of the paddock if needs be. Each paddock has a heated house which is also connected by a dividing door to the next stall. Cassowaries are prone to slip on hard smooth surfaces and can become splayed, to help prevent that all house floors and pools are rough finished with a wooden float. Likewise the floor to any crates used should be slatted. Lime stone should be avoided as a hard- stand substrate cassowaries will avoid walking on it and soon become lame if forced to stand on it for any length of time. For much of the year birds live a solitary life and need to be housed separately they do not acknowledge each other until early spring when they are seen to stand close together against the dividing fence. Pairing can be a dangerous time for the male. He is safe from her temper while he stands close to the her hence he rarely leaves her side during courtship. After he has copulated with her she will attack him this is when the enclosure vegetation is most necessary. If he can run and get out of sight he will soon be forgotten. Eventually he will work his way back to her side and begin the process again! The female chooses the nest site and lays up to five green eggs. If she selects an unsuitable site then it is possible to move the clutch after the last egg is laid and before the male begins his lone incubation. The female is removed before hatching takes place. Weights of our eggs have been recorded at 850, 838, 847, 824, 735, 762, 754 grams; The first eggs laid are usually smaller. Sizes range from 149mm to 140mm in length. And 99mm to 96mm in breadth. CHICKS are reared on a low protein fruit diet. Foods that are red or yellow in colour are eagerly investigated by the birds and help to get them feeding in the first few days. Within the first week as the birds become steady enough on their feet they are taken outside for some light exercise each day. To rear strong chicks it is important that they grow slowly and get plenty of exercise. As they grow stronger they are taken for longer walks into our woodland each day and allowed to bath in a stream. By the time they reach ten months of age they need a lot of walking and a run each day. Chicks will walk with a keeper until about 18 months after that it becomes harder to engage their attention and prevent them wandering. Cassowaries can be sexed by an experienced eye from 18 months of age. Females are bigger and longer backed by then and are also already showing some of their “stroppy” nature. The black plumage becomes entire at three years of age and at this time keepers no longer work in the enclosure with them. All in all a very rewarding bird to display and when managed correctly can make a high profile exhibit.